Yum Yum Yum!!! That's all I have to say about this shake. Okay...that's not all I have to say about it, but seriously it is YUM!!! Perfect for this holiday season! Did you know that studies have shown that people who start the date with a protein-rich breakfast consume 200 fewer calories per day? Part of this reason is because the amino acids help dull hunger leaving you feeling fuller for longer! 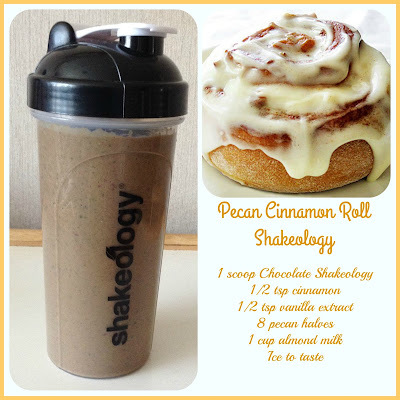 Shakeology is a full meal replacement shake that contains a whopping 17g of protein! Indulge the healthy way! This recipe is perfect for the holiday season. Get your breakfast in on the go or enjoy this for an afternoon snack!